Now that the holiday season is in full swing, it’s time to start preparing for all of the delicious meals that will be happening shortly. From the tasty Thanksgiving turkey to the warm rolls paired with your Christmas dinner, there are all sorts of delicious food items that you’ll have in your kitchen for the next couple of months. As a whole, it’s known that humans consume much more food during these months of the year. Unfortunately, that also means that pests have additional food to use as a resource. In our last blog post, we touched on a few of the pests that you’re most likely to find during the holiday season. Each of these pests is looking for two things: warmth and food. When your home is able to offer both, you can almost guarantee a problem with pests. The one thing you can do, however, is to prepare your food and home for the pests that you’re most likely to encounter. Keep reading for a few of the ways that you can keep pests from getting into your food this season. The room that you need to be most cautious of this season is your kitchen. Not only is it the room that is going to have all of the food in it, but it’s also got plenty of dark spaces for pests to hide. If you’re really wanting to make sure that you keep pests out of your home and, more importantly, out of your kitchen, then you need to keep your kitchen clean. Whether you’ve just prepared a meal or you’ve just finished enjoying one, spend some time cleaning up the kitchen so that there aren’t scraps of food left out for pests to enjoy. Leftovers are one of the best parts of the holidays! But, they’re not something that you want to share with pests. For that reason, it’s important that you store your food wisely. This goes for both before and after a meal. The only way to ensure that pests don’t get into your food is by storing all items wisely. From your produce to your meat, all of your perishable items need to be stored properly in order for them to remain free of pests. We always suggest Tupperware that have a tight lid or Ziplock bags that you can seal. Both of these options keep pests out of your Thanksgiving food, but they also keep your food fresh for when it’s time for leftovers. Make sure to stock up on both of these items before the holiday season so that you’re not left without storage containers. Trash is the place that is most likely to draw in pests. From the leftovers after cleaning up the table to the scraps that you acquire while preparing the meal, having easily accessible food in your trash is going to lead to a pest problem. Though it’s not ideal to have to clean up immediately after a nice meal, handling your scraps is one of the best things that you can do to avoid pests. Once you’ve picked up the plates from the table, immediately scrape any leftover food on the dish into the trash can and rinse off the plates. By removing all food that was on the plate, immediately putting it in the trash can, and giving the dish a rinse, you can ensure that there isn’t any food sitting out for pests to snack on. Trash cans come in all shapes and sizes, but when you’re worried about pests, or pets, getting into the trash can, it’s always good to invest in a trash can that has a lid. Not only do these trash cans keep the smell of trash out of your home, but they ensure that nothing is able to get into the scraps that you’ve just thrown out. Think back to the point where we talked about making sure that the food that you’re storing is sealed tightly in containers — this is very similar! You want to ensure there is a tight seal keeping pests out of your trash can so that they aren’t feeding off the items you’re throwing in there. If you really want to be proactive with pests, consider getting a lid for any trashcans that you have outside as well. Trash cans that are in your garage or outside of your house can make it even easier for pests to make their way into your home. By being proactive, you’re already less likely to deal with pests this holiday season. While everything that we’ve mentioned above can help you stay proactive with keeping pests out of your Thanksgiving meal, it’s much more difficult to ensure pests stay out of your house when you’re already dealing with an infestation. If that’s the case for you, contact the team of pest control professionals at Earthwise Pest Management. Our pest control company has worked in the Sacramento area for years and is thankful for the opportunity to keep homes free of pests. 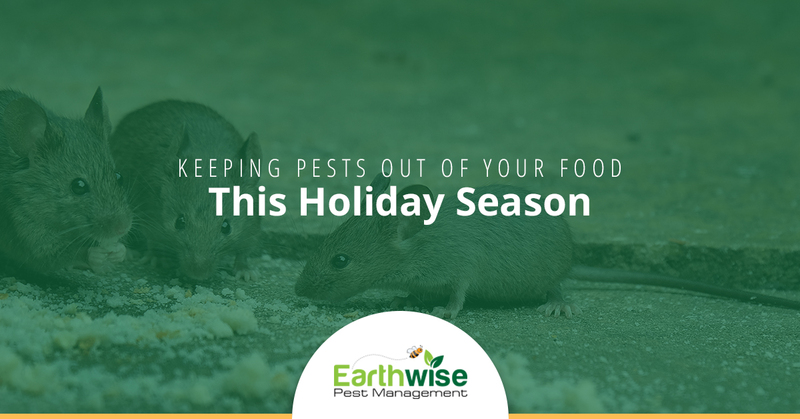 If you’re in need of pest control services prior to the holidays, reach out to us today. We’d be happy to set up a time to take care of any infestations that you may be dealing with. That being said working with a professional and taking advantage of these proactive tips should keep you in the clear this year.